If you know of an event that you think I would be a good fit for, please don’t hesitate to contact me and let me know when and where it’s happening. 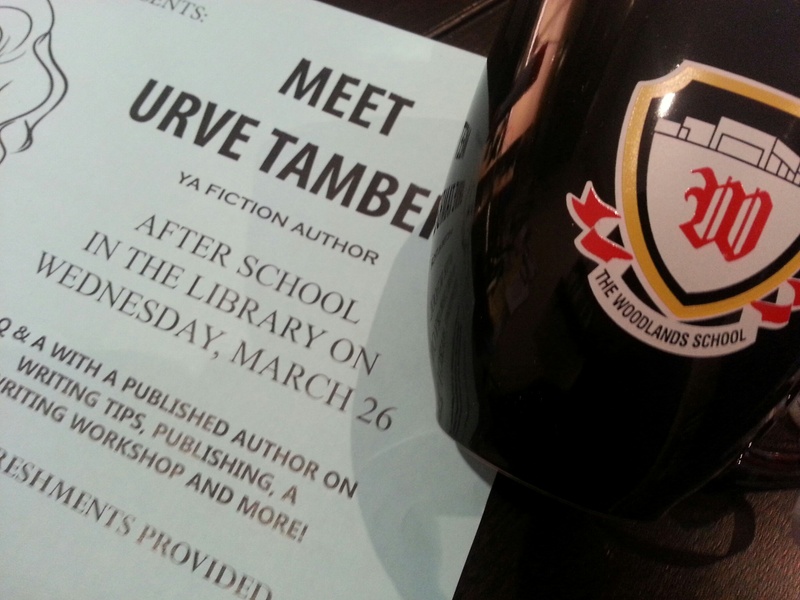 If you’re on Facebook and would like to stay up-to-date on events, please visit my Facebook Page: Urve Tamberg – Author. May 3, 2015: What a Character! I’ll be conducting a workshop on how to develop compelling characters at The Art and Soul Initiative – a one-day youth art conference in Mississauga, Ontario. November 19, 2014: I am thrilled to be a judge for the Write2Xpress contest for Oakville teens in Grades 7 and 12. November 15, 2014: Chicago Estonian House. Christmas Market. For more information, click here. March 26, 2014: The Woodlands Secondary School. I am looking forward to meeting the Woodlands Writing Club. Details here. March 9, 2014: Sarasota, Florida. Looking forward to sunshine and palm trees! I will be reading and signing books at Barnes and Noble (4010 S Tamiami Trail, Sarasota) from 2:00 to 4:00pm. Hope to see you there! Please pre-order books by March 1, 2014 from Donna at 941-923-9907. 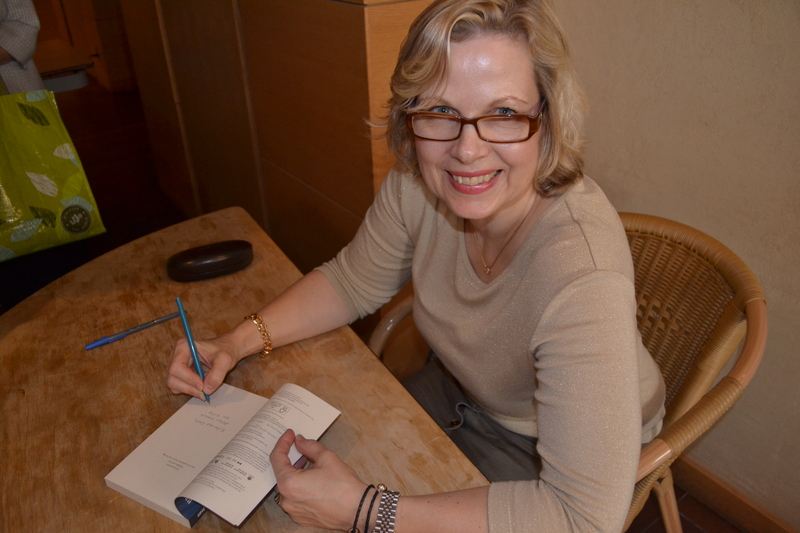 December 10, 2013: Tips for writing your memoir. Workshop in Oakville. November 21, 2013: Write2Express Awards Ceremony. Oakville. I’ll be the keynote speaker at the Awards ceremony for Write2Xpress. 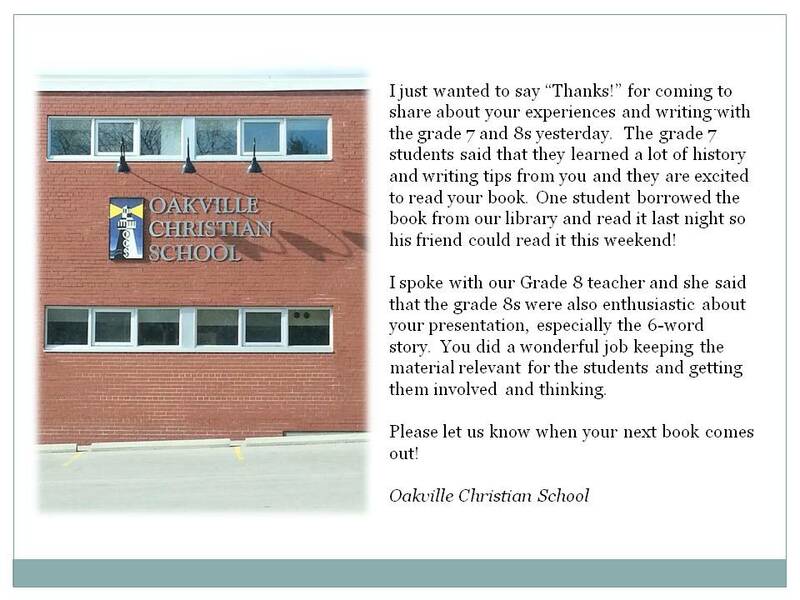 This short story and poem contest is open to all Oakville students in grades 7 to12. The contest open September 9, and closes October 21. Good luck to all participants! October 29, 2013: Success Stories. Humber College Fall Workshop. Harbourfront. A few years ago, I attended The Humber College Workshop for Writers (and if you are a writer, you should consider this course – it attracts a super talented faculty). This year, I’m thrilled to be invited to speak about my path to publication. October 4, 2013: Along with other authors, I’ll be reading at the Babar En Ville book store, 1235-A Greene, Westmount, Quebec. Many kidlit authors are in town that weekend for the SCBWI East conference, and lots of us will be at the book store to do a reading, or just hang out with friends. Everyone is welcome! September 22, 2013: Word on the Street, Toronto. I am volunteering at the CANSCAIP booth from 2pm-4pm. Come check out some great children’s writers and illustrators. Hope to see you there! 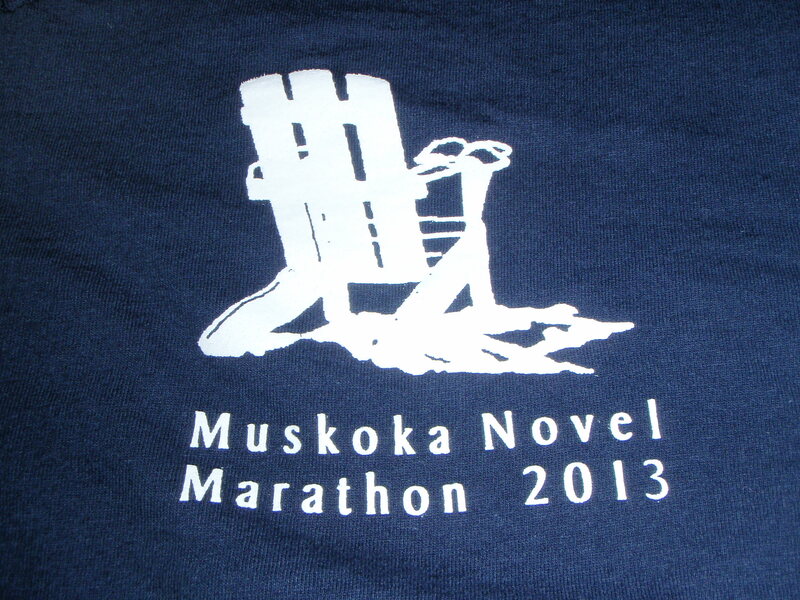 September 21, 2013: Muskoka Novel Marathon Wrap-up, Huntsville. I’ll be conducting a workshop for the authors on how to develop a Unique Value Proposition. If you want more information on workshops, please click on my “For Writers” tab, or connect with me on LInkedin. April 9, 2013: Writing about the Baltics. A discussion exploring the challenges, nuances and surprises of depicting the Baltic States. 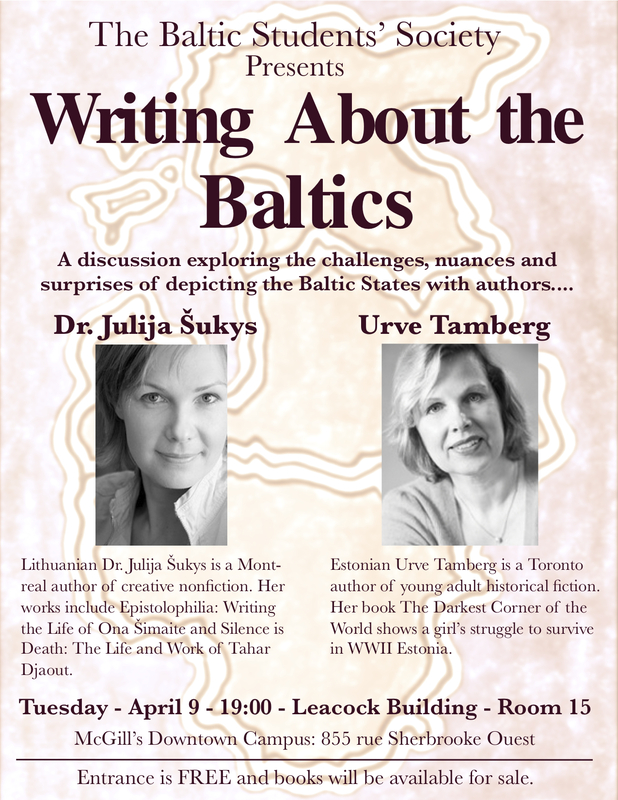 Hosted by The Baltic Students Society, McGill University. The session will start at 7:00pm at the Leacock Building at 855 rue Sherbrooke Ouest, Montreal. All are welcome. April 8, 2013: Montreal CANSCAIP meeting at Livres Babar Books in Pointe Claire. I’ll be doing a workshop/presentation on marketing. Learn how to develop a “unique value proposition” that differentiates you from everyone else. January 31 – February 2, 2013: I’ll be at the OLA Super Conference at the Metro Toronto Convention Centre. On Friday, February 1st, from noon till 2:00pm, I’ll be at the OLA CANSCAIP book launch in the EXPO theatre. Please come and listen to 20 authors (including myself) and illustrators talk about their 2012 publications in entertaining five-minute presentations. 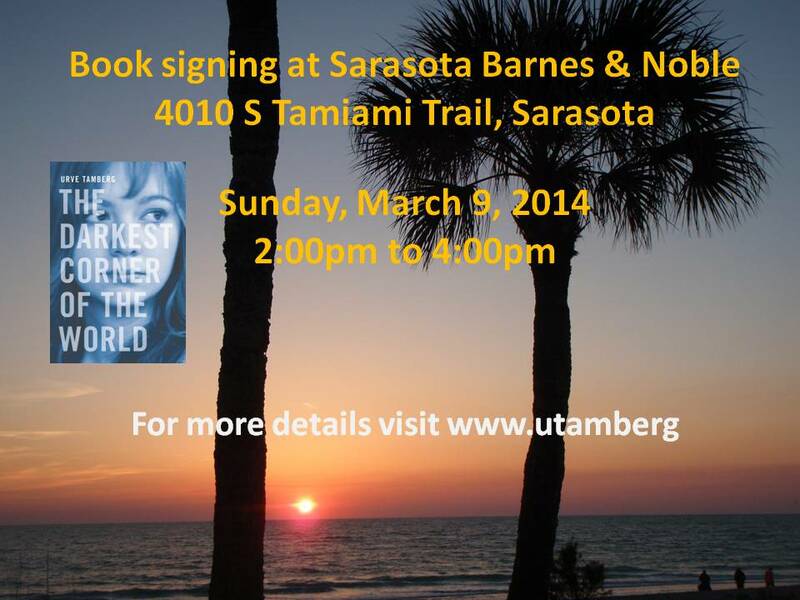 At 3:00pm, I’ll be at the OLA bookstore signing copies of The Darkest Corner of the World. Sunday, December 2, 2012: I’ll be reading at Lit Live in Hamilton. Saturday, November 17, 2012: Chapters at Dorval Crossing, Oakville (310 North Service Road West). From 1:00pm to 4:00pm, I’ll be signing books. Please drop by and say “hi”. Thursday, November 1, 2012: Book Club, Toronto. Friday, October 19, 2012: Collected Works Bookstore, Ottawa. Join us from 6:00pm to 9:00pm for SCBWI’s 2012 celebration of children’s books. Come mingle with writers and illustrators, and hear them read from their latest works. Saturday, September 29, 2012: THE DARKEST CORNER OF THE WORLD book launch!! It will be held from 2:00pm to 4:00pm at Tartu College (310 Bloor Street, just east of Spadina). Please come and celebrate with me!! There will be kringel! Books will be available for sale, and I’ll be signing. All are welcome. Please RSVP to rsvp@cormorantbooks.com. Sunday, September 23, 2012: Word on the Street, Toronto. I’ll be signing books from 3:30-4:00pm at the Cormorant Books/Dancing Cat Books booth. Hope to see you there!